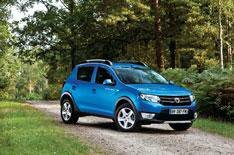 Dacia Sandero Stepway announced | What Car? The Dacia Sandero Stepway has been revealed, with the cut-price supermini about to become the third model to join the Dacia range in the UK. It is based on the Sandero supermini, but comes with SUV-like styling, front and rear scuffplates, black wheelarch cladding and chrome roofbars. It also gets 16-inch alloy wheels and body-coloured mirrors and bumpers as standard. The changes are not all visual, though the Stepways ride height is 40mm higher than the standard Sandero's. Two trims are available Ambiance and Laureate and there is a choice between 0.9-litre petrol and 1.5-litre diesel engines, with both offering 89bhp. The petrol emits 125g/km of CO2 and averages 52.3mpg, while the diesel has emissions of 105g/km and average economy of 70.6mpg. As well as the alloys and styling additions, Ambiance trim includes four airbags, stability control and 60/40 split-folding rear seats as standard. Laureate trim adds air-conditioning, a chrome front grille, electric windows, electrically adjustable heated door mirrors, a seven-inch touch-screen sat-nav system, aux and USB inputs, cruise control and rear parking sensors. The 0.9-litre Ambiance costs 7995, with the Laureate version at 9795. The diesel engine adds 1000 to the price in both trims. Order books open for the Sandero Stepway on January 1, 2013, with deliveries from May.